Police and wildlife officials raided a Najomtien elephant camp, seizing a wild elephant and arresting its owners for illegal documentation. Officials from the Department of National Parks, Wildlife and Plant Conservation and Forest Animals Conservation office joined local, national and tourist police officers in the Aug. 26 operation at Elephant Camp Co. in Sattahip’s Moo 3. Arrested were mahout Ekachai Kanjanaphattrakul and owners Yupha Rattanawongsawat, 32, and Suphap Sala-ngam, 38. 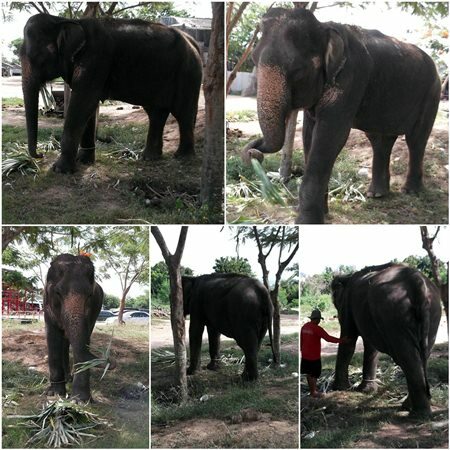 Police also issued an arrest warrant for Surat Termsak, who sold the elephant from Chaiyaphun seven years ago. 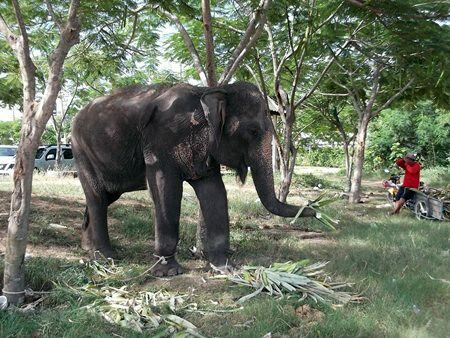 Police and wildlife officials raided a Najomtien elephant camp, seizing “Phunzup,” a wild elephant sold as domesticated using falsified documentation. Wildlife officials also took custody of 47-year-old elephant “Phunzup,” a wild elephant sold as domesticated using falsified documentation. The arrest came as Thai officials launched a nationwide crackdown on illegal elephants, many of which were shipped over the border from Myanmar with falsified documents. Fourteen unregistered or illegally registered elephants were taken in simultaneous raids on tourist destinations in the provinces of Phang Nga, Phuket and Krabi. Another two were seized in Trat province. Suphap and Yupha pleaded with officers not to take the animal, which they said was their sole means of income for their family of six. They’d paid 400,000 baht to Surat for the elephant, having to borrow money at 3 percent interest from relatives and promise to support two family members at the Pattaya-area camp in return for the loan. Since then, the elephant has been used to provide rides to foreign tourists.